Mrs. Elizabeth H. Gibson and the devoted service she gave to Malaysia will never be erased from the annals of the Faith. Mrs. Gibson was a great driving force and she served in various capacities in several parts of the country. Her coming to Malaysia was said to be providential, as openly acknowledged by many Bahá’ís who worked with her or observed her indelible services in Malaysia. Her close to a three-year period of service in Malaysia, though short, will always be remembered as a period of dynamism in many ways. She rendered invaluable services through her active involvement in various areas of services. Mrs. Gibson shall be remembered as a fine example of excellence in both fieldwork, and administrative services for the Cause. She was highly energetic, relentless, well organized and meticulous in whatever area of work she undertook for the Cause. Mrs. Gibson and her husband Dr. Doughlas H. Gibson from California, USA came as American pioneers to South East Asia. Dr. Doughlas was to be posted to Vietnam to teach oral surgery for the US Agency for International Development. Mrs. Gibson was given the choice of selecting any country of her choice within South East Asia. She chose Malaysia. Dr. Doughlas and Mrs. Gibson starting their journey from California, USA, August 1970. She came to Malaysia in September 1970 and remained until February 1973. She moved into a spacious bungalow in the Titiwangsa area, behind the second National Bahá’í Center and served as a full time servant of the Cause. Mrs.Gibson’s two, school-age children traveled with her. And her husband, Mr. Doughlas, used to visit his family in Malaysia once in a while, and he would join in the Bahá’í activities. When Mrs. Gibson arrived into Kuala Lumpur, a line of activities was already assigned to her and she was appointed into committees. She started off with a string of non-stop activities, going around the country visiting and deepening Bahá’ís in urban areas, estates and the deep jungles. She arrived on time to join in the Regional Youth Gathering that was held in the National Bahá’í Center on 12 – 13 September 1970. The inauguration of the Bahá’í Society at the University of Singapore in September 1970 also coincided with her arrival in Malaysia. She flew down to Singapore to be the guest speaker. That was her first major event as a speaker in this part of the world. Even when she was in the USA, she was already well exposed and experienced in the area of proclamation and external affairs work of the Faith. On 24 October 1970, in Alor Star town, the United Nations (UN) Day was observed and attended by more than 100 persons. Mrs. Gibson was the guest speaker. She proved to be a dynamic speaker in this first, major proclamation work. Again, the Local Spiritual Assembly of Kuala Lumpur observed the UN Day on 24 October 1971. The theme for that year was “International Year for Action to Combat Racism and Racial Discrimination.” Inbum Chinniah was the Chairman of the session with Mrs. Minna Chew, Director of Information for the UN Development. Mrs. Gibson showed slides of the United Nations Headquarters in New York. The response from the audience was wholehearted enthusiasm. The Tamil-speaking radio announced the meeting with full particulars over the air the day before. The Chinese press printed a release. The next day, the Malay Mail covered the event with a quarter-page story and photos. The Malaysian National Television (RTM) wrapped up the coverage with a lengthy resume of the meeting on the world news program the following week. It was a resounding success in every way. Having accepted the Faith in 1963, she was active in the area of public affairs such as the Race Unity Day. During her stay in Malaysia, she was a natural choice for representing the Faith in this capacity. 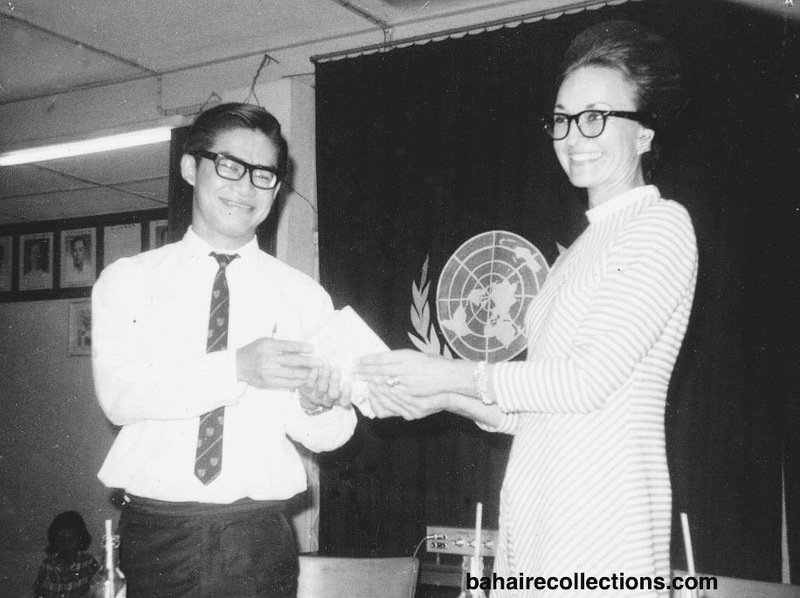 Dr. Choy Men Kong, Secretary of Rotary Club receiving two books from Mrs. Gibson, at United Nations Day, 24 October 1970, Alor Star. 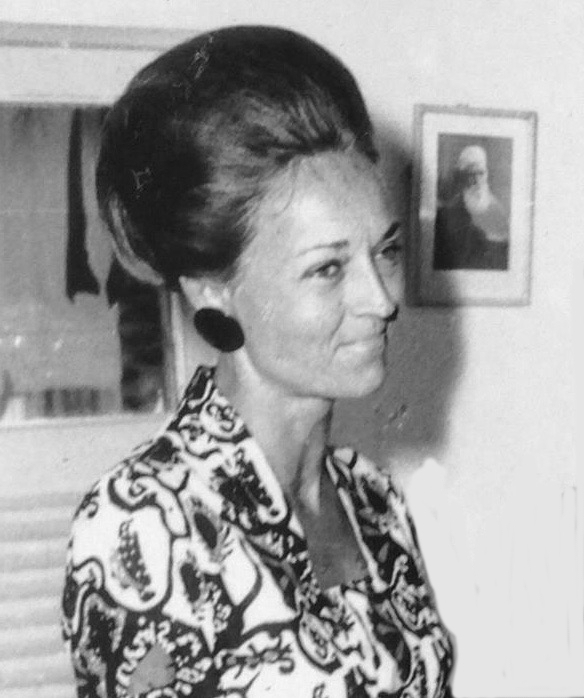 During the course of her first phase of travels across the country, she encouraged Bahá’ís to attend the Oceanic Conference of the South China Seas scheduled to be held in Singapore in the first week of January 1971. During these trips, she conducted deepening classes using cassette recordings of the Hand of the Cause of God Mr. William Sears. She herself was seen as a happy participant at the Oceanic Conference. She quietly assisted Bahá’ís without means to attend the conference. She was an asset to the Kuala Lumpur Local Spiritual Assembly and had contributed, within that short period of time, to the consolidation of the Kuala Lumpur Bahá’í community. She was magnanimous in providing the best hospitality to many Bahá’ís, especially in providing accommodation at her bungalow, and in caring for the travel teachers staying at the National Bahá’í Centre. Her rented bungalow functioned like a Bahá’í Centre in its own way, much like a hive, buzzing with activities. These activities sometimes included marriages. 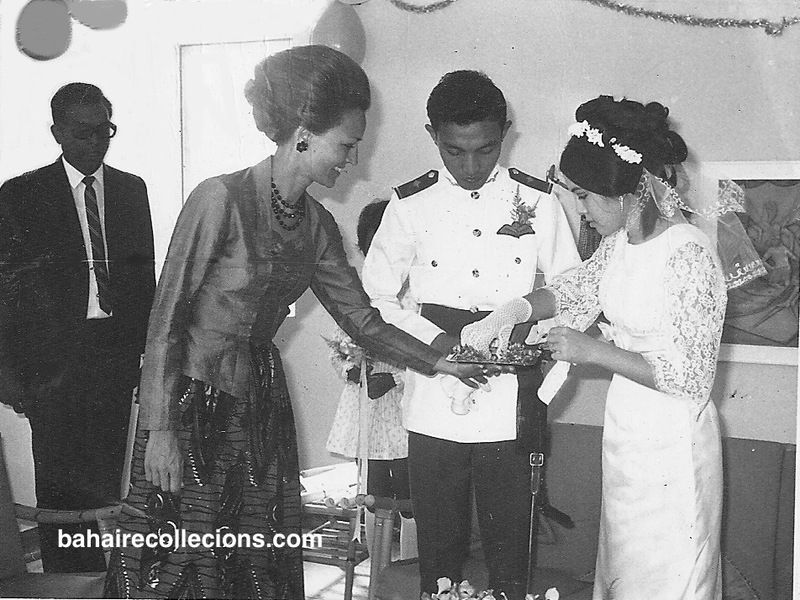 The wedding of Choo Yoek Boon to Grace Chong was held in her bungalow on 11 May 1971. The wedding of Choo Yoek Boon and Grace Chong at her residence. At the extreme left is Master of Ceremony Inbum Chinniah. Ms. Gibson organized weekly firesides for people of capacity whom she won over within a short period of her arrival in Kuala Lumpur, starting with teachers in the International School where her children Debbie and Peter were studying. She asked C. Kanagaratnam, then serving as Administrator in the National Bahá’í Centre, to occupy a vacant room in her bungalow. He says Mrs. Gibson was excellent in the area of public relations, and she used this talent to organize those firesides in great style. She placed many Bahá’í books and prayer books in the living room and insisted on having devotional meetings each morning and evening, quoting from the text of the Writings. Her home provided a true Bahá’í atmosphere. It is quite amazing how Mrs. Gibson was able to learn and pick up the local Malaysian way of life and become fully blended with the Malaysian Bahá’í community within the first few months of her arrival. She had the rare talent of memorizing the names of believers she met in the first instance and would call them by their names in her next meeting with them. Mrs. Gibson came to be loved by Bahá’í s from all walks of life – those from the rural areas, rubber estate plantations, tribal jungles, and urban areas. Her radiant disposition and the sincere love she showered upon all, attracted Bahá’í s to her presence. 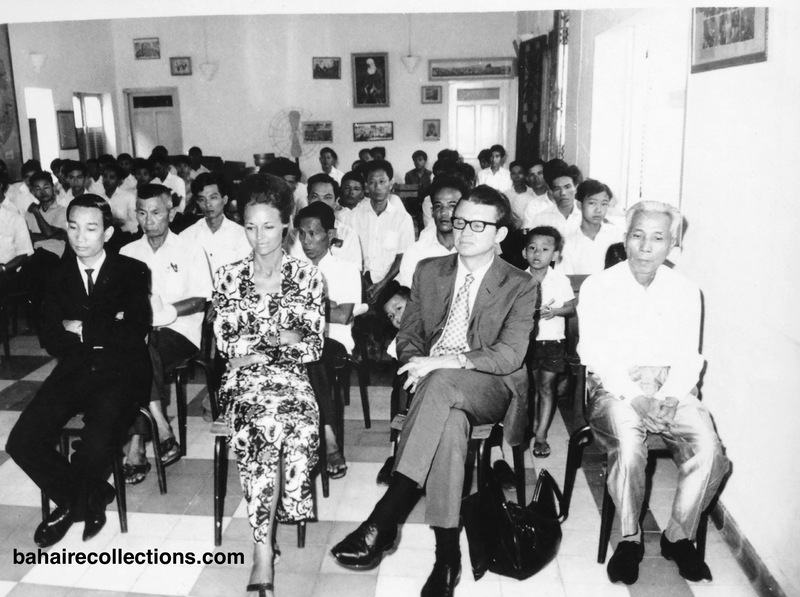 Mrs. Gibson is seated fourth from right, next to Leong Tat Chee at a weekend gathering in the National Teaching Institute, Malacca, 1971. She was a good administrator. She put all her actions and deliberations based on the Writings and made everyone conscious of the need to always go to the source. When she arrived in Malaysia, she was appointed into the National Coordinating Unit together with Ravichandran, Thanabalan, and N.S.S. Silan. 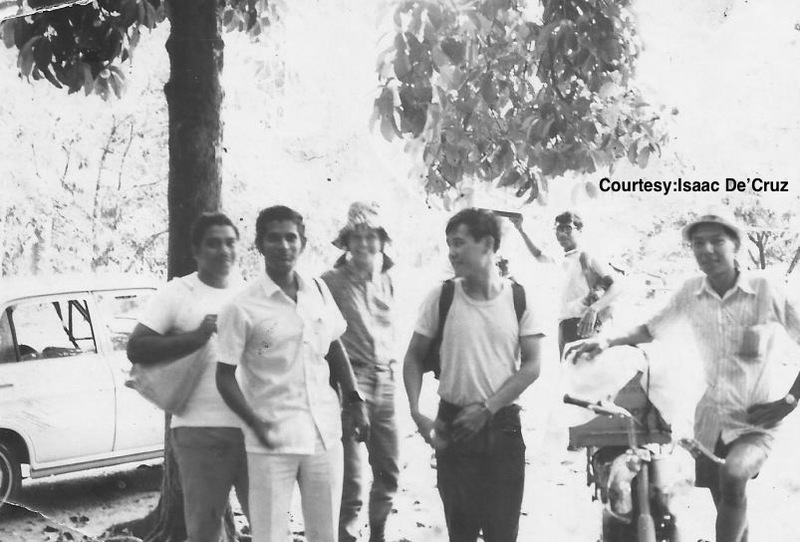 In March 1971, Kamachee from Alor Star came to Kuala Lumpur to serve under the National Coordination Unit and had intended to stay in one of the rooms in the Bahá’í Centre. Mrs. Gibson, unasked, took Kamachee to her bungalow for the proper accommodation that any lady would need. Mrs. Gibson was a very serious and result-based person. The National Coordinating Unit met each Wednesday, and she made sure all members of the Coordinating Unit moved throughout the country. Almost every weekend they were out into the field, visiting almost every community in the country. With tremendous energy within herself, she was on the move at all times and brought with her a lot of experience and challenges. Mrs. Gibson always went by the book, and that caused some ‘ripples’ in the Malaysian Bahá’í community. But she only wanted to protect the image of the growing Faith. On a one-to-one basis, she was a very warm person. One could easily see her magnanimity. She used to come to the National Bahá’í Centre, and join the staff for breakfast, with their permission, at the back room behind the kitchen. She herself would toast the bread and apply butter and jam on the bread. She would encourage them to eat well to serve well. Sandrakasan, who worked at the National Bahá’í Centre in those days often recalls with fondest memories the generosity and magnanimity of Mrs. Gibson. Off to Asli teaching with S. Satanam and Isaac De’ Cruz. During Ridván 1972, the Hand of the Cause of God Mr. Jalal Khazeh represented the Supreme Body at the first National Convention of Singapore held on April 22 and 23 and gave clear guidelines to run the convention according to strict convention rules. Mrs. Gibson was a participant at that Convention and read out congratulatory messages received from other National Assemblies from around the world. She also noted the strict Bahá’í Administrative rules pertaining to the convention that Mr. Khazeh gave at the convention in Singapore. 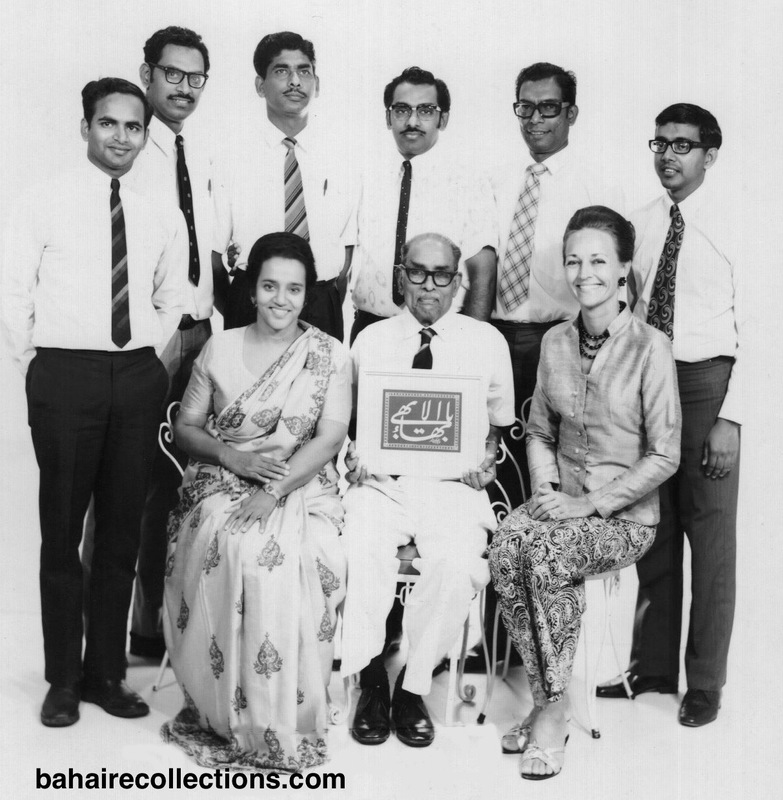 When Mrs. Gibson was elected the Convention Chairperson at our own convention, held a few days later in 1972, she made sure the guidelines given by the Hand of the Cause at Singapore were also followed in Malaysia. Whereas in the past both delegates and observers had a free seating arrangement at national conventions, there was no clear demarcation line between delegates and observers. For the first time, she set the demarcation line and provided for delegates to be seated in the front rows. That precedent is still being followed to this day. During that convention, Mrs. Gibson was elected to the national institution and served as Assistant Secretary before joining her husband in Saigon in February 1973. 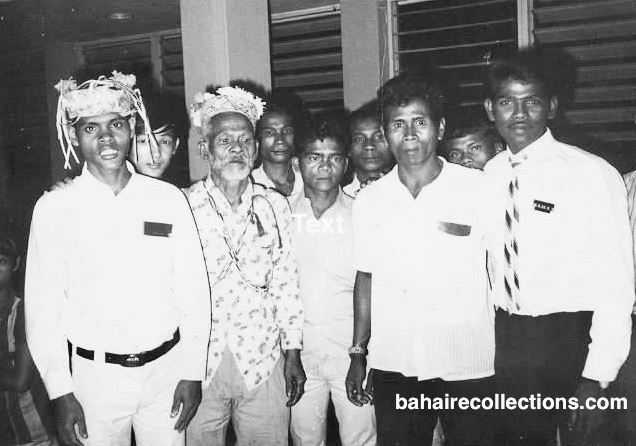 Other members who served on the national institution with her were Mr. S. Bhaskaran, S. Nagaratnam, Dr. M. M. Sreenivasan, Mr. Ganasa Murthy, Mr. Inbum Chinniah, Mr.N.S.S. Silan, Mrs. Shantha Sundram, and Mr. K. Rajah. On the National Spiritual Assembly, 1972. One of her greatest contribution to the Malaysian Bahá’í community was pushing the Bahá’í women of Malaysia to rise to great heights of service. There were several Bahá’í women who were strong pillars in their individual rights but were quite slow in functioning as an organized group. The institutions saw the need for them to rise to a higher level of service. Mrs. Gibson provided the needed moral support and availed her bungalow for several women gatherings. 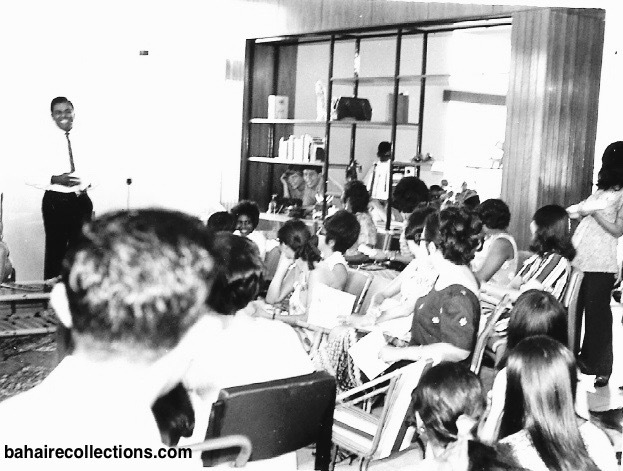 On 4 October 1970, a women’s conference was held at her bungalow, organised by the Local Spiritual Assemblies of Kuala Lumpur and Petaling Jaya. The bungalow was well decorated and the 75 participants were each presented with an orchid and a star-shaped name tag. Mrs. Shantha Sundram opened this conference. Mrs. Gibson gave a talk on “Nature of Women”; Lily Chinniah spoke on “Bahá’í Concept of Child Education” and Lily Ng spoke on “Equality of Women.” There was a singing session followed by a demonstration on “Facial Make Up” by Pauline De’ Cruz. A booklet entitled “The Oneness of Mankind and Equality of Men and Women” was given to all participants. The participants were so thrilled by the spirit generated at this gathering that they wished to hold more conferences. Lily Chinniah speaks at the Women’s Conference. Mrs. Gibson is seated at the extreme left and Dr. Douglas at the extreme right. Inbum Chinniah addressing a gathering at the spacious bungalow of Mrs. Gibson. One of the best-remembered conferences was the National Youth Conference, arranged in the Dewan Belia in Kampung Pandan, Kuala Lumpur from 4 to 6 December 1971. While answering questions at the Panel Session, Mrs. Gibson proved to be a highly deepened Bahá’í, able to answer questions on several angles. 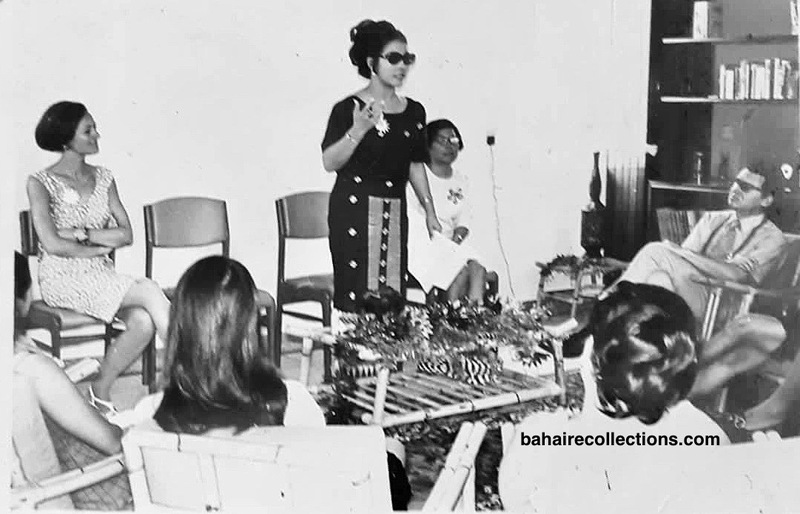 At the first Winter School of Malaysia held in Johore Bahru in December 1972, the speaker who was to speak on the topic of “The Universal House of Justice” did not turn up so she stepped in to fill in the place. The Bahá’ís friends were impressed with her eloquent and detailed talk on several aspects of the majesty and greatness of the Universal House of Justice. She also spoke on the Most Holy Book. It dawned upon the believers that she was a master of several Bahá’í topics. She was well conversant with the content of the book The Dawn-Breakers. 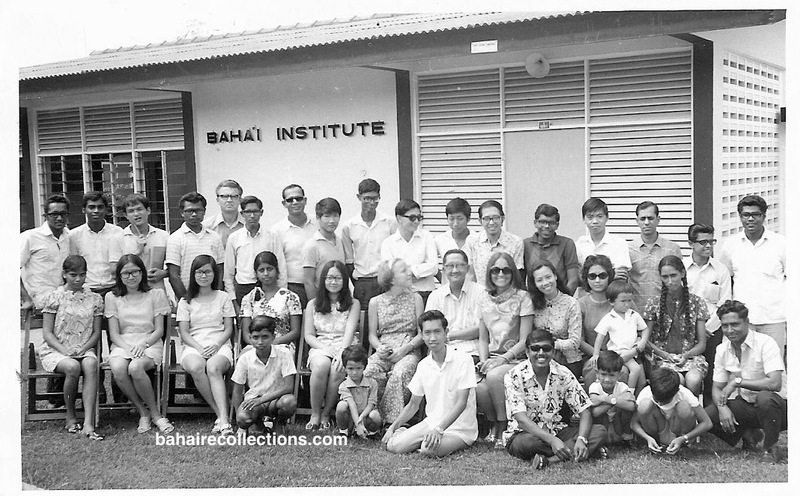 Mrs. Gibson, standing fifth from the left at the first Bahá’í Winter School, Johore Bahru, 1972. Her generosity saw no bounds. Mrs. Gibson made it a point to come to the National Bahá’í Centre at least thrice a day, in the morning, noon and evening, to look into the needs of travel teachers, youths and Asli believers who used to stay overnight there. She was an early bird and each morning she used to bring heavy breakfast, much before those staying in the Centre woke up. On several occasions, she even invited them to her bungalow for sumptuous meals. When the numbers ran high, she would bring large amounts of food to the Bahá’í Centre. This was one area of service she carried out throughout her stay in Kuala Lumpur. She would come around the Bahá’í Centre to look out for travel teachers, and slip money into their pockets. When she arrived in Malaysia in September 1970, she bought a car and was looking for a driver. She wanted a Bahá’í who had a driving license and needed a job. A few names were put forward, but she chose Munusamy from Sepang who was looking for a job. She paid him well, outfitted him and made sure he turned up at the Oceanic Conference of South China Seas in Singapore in style. Mrs. Gibson also adopted Angelina, an African girl, disciplined her in the Bahá’í way, and made sure the child’s medical needs were met. She later told Chong Boo Haw of Alor Star that it was always her desire to give a good life to the most unfortunate in the society. When she was in China, she adopted another child. When she left, a farewell party was given to her and it coincided with the opening of the Kuala Lumpur Local Bahá’í Centre at 18, Jalan Air Bah Dua, Hot Spring Gardens, Setapak. That was an event where no eye was dry. From Malaysia, she went to join her husband in Vietnam with her children Peter, Debbie and little Angela. From there she and her husband pioneered to Nigeria in the later part of the 1970s. She was Auxiliary Board Member for North Nigeria. In Nigeria, her daughter Debbie (who was a special child) married a local Nigerian boy, and this sadly led to the separation between Douglas and Mrs. Gibson. Next, she pioneered alone to Liberia in the early 1980s. Her adopted daughter Angela came to stay with her in Liberia. There too Mrs. Gibson opened her home for Bahá’í hospitality and won the hearts of the local people. Mrs. Gibson worked as a teacher trainer at the Demonstration School College, and was elected on the Local Spiritual Assembly of Kaka, and served with her usual distinction. In 1986, she also conducted workshops for the future staff of the first radio station of Africa that was established in Monrovia, on the basic principles of broadcasting and the philosophy of Bahá’í radio. Leaving Liberia, much later she spent some time in China and visited her close friend N.S.S. Silan in Mongolia. Her heart was always with the Malaysian Bahá’is. When she turned up at the Second World Congress in New York, she spent most time hugging the Malaysians and other Bahá’is she had befriended in her foreign trips for serving the Cause. Chong Boo Haw of Malaysia with Mrs. Gibson at the Second Bahá’í World Congress, New York. Her later years were spent back home in California, USA. She kept sending and receiving letters from the believers in Malaysia. When email became popular she communicated even more frequently with the Malaysian Bahá’is. Towards the end of her days, she was terminally ill and kept under hospice care. She was resting at her home in Oxnard. Yet she was in excellent spirits and eagerly looked forward to ascension to the Abhá Kingdom. Even from her death bed, she was still communicating with friends through the assistance of a secretary who sent out and received emails on her behalf. She was regularly communicated with N.S.S. Silan whom she called him “My Dearest Brother” until the very end of her days. In all her emails she inquired about the health of several friends in that country. She also set up an answering machine attached to her telephone, so that she never missed a message during moments she was not able to take the calls. Mrs. Gibson passed away in Oxnard, California on Wednesday, 25 April 2007. Thus ended a meaningful life led only to make her Heavenly Father happy. Her whole life was spent in bringing cheer to the lives of the downtrodden. However not many would know that although outwardly Mrs. Gibson was a very radiant and joyful person, she was lamented deeply for the untold sorrows and challenges she faced in her own family life. This multi-talented believer was active in radio and television writing. She was an actress and model, and had written several plays including “Blackboard Jungle” and “Black Sheep, Black Sheep.” Mrs. Gibson, an author, editor, and artist, includes in her published works “Hope Springs Eternal” and “Blackboard Jungle.” She was a member of some Non-Governmental Organizations, spending more than 20 years working to improve socio-economic conditions in Asia and Africa. 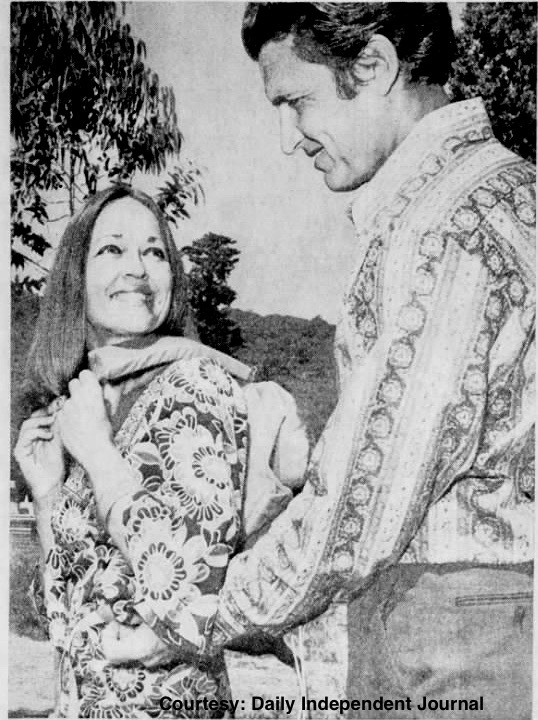 Mrs. Gibson in the Malaysian “kebaya” dress with her husband in Vietnam – a great loss to Malaysia and a precious gain to Vietnam. Mrs. Gibson will always be remembered for her warm hospitality and organizational excellence. Her impact on the Malaysians were that she made them become more administrative and organized and for the youth who were in the forefront, she instilled in them a spirit of service and dedication based on the example of Shoghi Effendi. Her departure after almost three years of being a Malaysian, leaves a gap that is hard to fill. She was a fantastic, high-spirited and forever-smiling lady who did great things for His Cause.